Yvonne Margarula is the Senior Traditional Owner of the Mirrar Gundjehmi clan, a position foreign to most Western minds, but which largely means that she is responsible for the physical and spiritual well-being of her people and, preserving it for the coming generations. 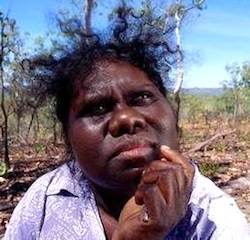 She is the protector of their traditional lands which lie within Kakadu National Park, also the richest underground Uranium site in Australia which has been and is still under threat of those who would strip its resources. Yvonne and her clan members used legal action and massive civil disobedience to create one of the largest blockades in Australia's history. She is an activist for both the environment and for the rights of indigenous people to determine their own destinies and the destinies of their traditional and legally held lands.